We are always looking for ways to make the ApprovalMax platform bigger and better. And one of the most sought after improvements has been the ability to create reports. So we’re very pleased to announce that this highly anticipated feature is now available. It has been designed to meet the daily needs of our users by offering them an aggregated view of approval progress by approver, supplier, due date, and other select criteria. In this blog post we’ll take a quick look at this shiny new feature, and suggest a few ways you could start using it to make your approval process (and your life) that little bit easier. To access this brand new feature, simply navigate your way to the menu in the top left-hand corner of the platform and select ‘Reports’. You will then be greeted with the option to create a new report, or select one of the default reports that we’ve prepared for you. 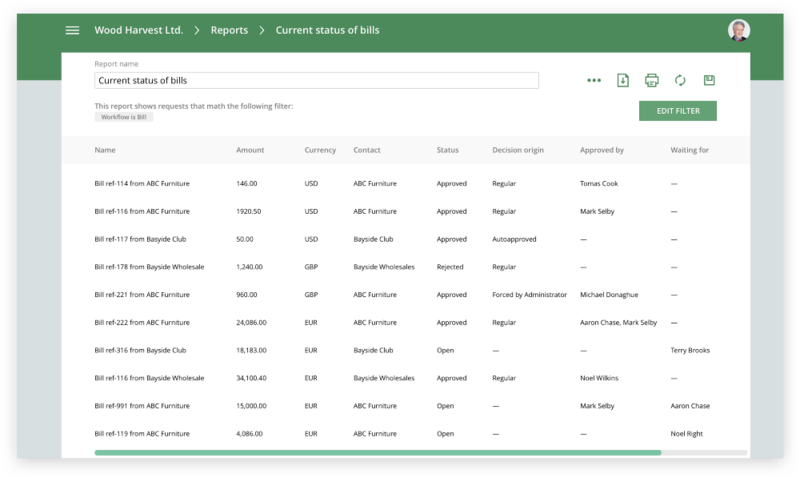 The default reports are there to get you started, and have been designed to support the most common reporting scenarios. However, we appreciate that not every organization wishes to review the same information, and so the custom reports can be easily configured by selecting the most relevant criteria for your specific reporting needs. When you create a new report, first give it a name by completing the ‘Report name’ field. 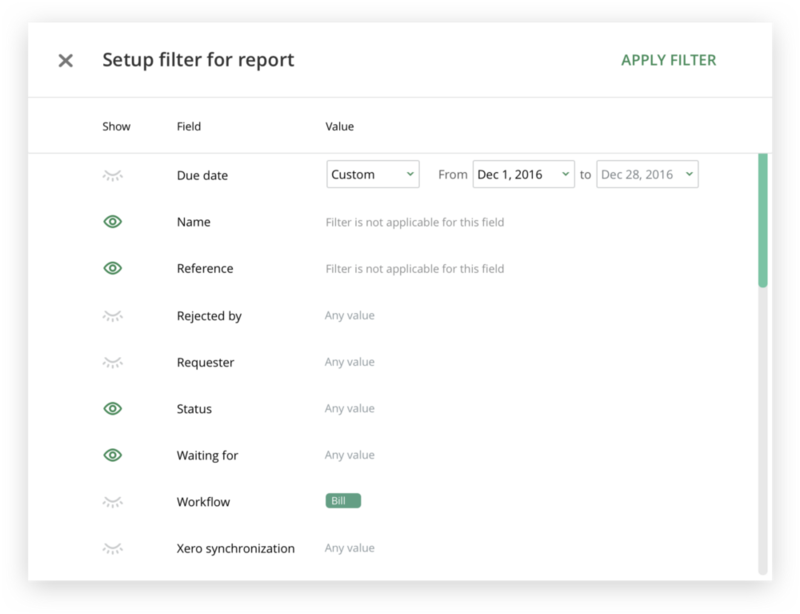 Next, you’ll have the option of choosing and applying filters to your report. Finally, you can save the report and download it as a print-ready document, or export it as a .csv file for further analysis should that be required. There are hundreds of ways to use the reports to benefit your company’s approval process. 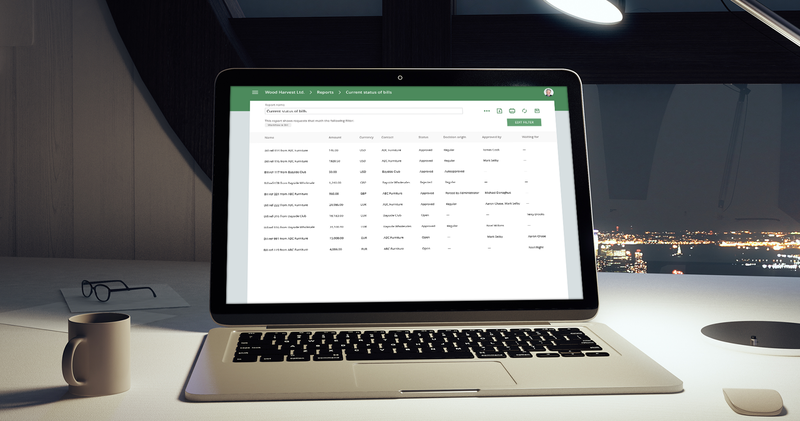 Thanks to the option to apply filters, you can drill down and review the information that matters most to your department or business as a whole. Get a complete overview on all Bills pending authorization. Spot bottlenecks, find out who you’re waiting for, and take the appropriate action to speed up the process. View the current status of Purchase Orders (POs). This is useful to check if POs have been auto-approved by mistake due to incorrect conditions set in the Approval Matrix. Or, you could review all rejected POs in case something was rejected by mistake, or should be reviewed and approved at a later date. View all Bills forced by an Administrator. Perhaps you’re busy and choose to delegate the approval process to the platform Administrator. You can run a report and review the approvals later. 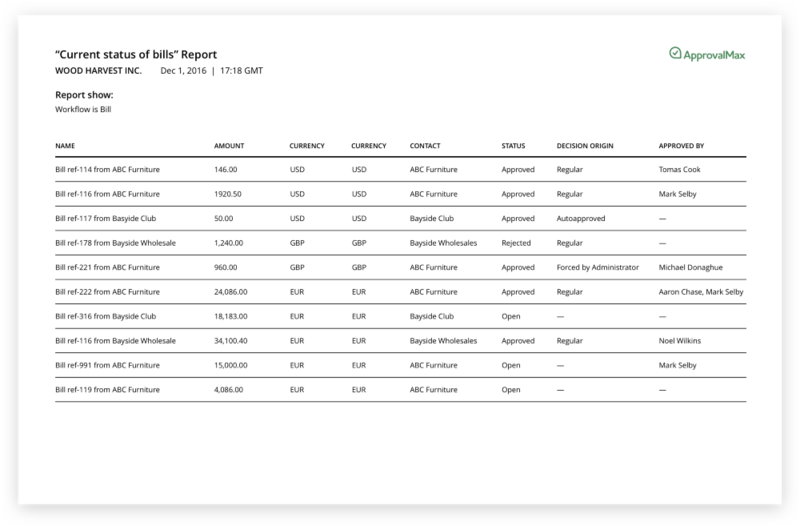 See the Bills or Purchase Orders that have been approved but have not been fed to Xero. Occasionally a Xero update can break the integration between Xero and ApprovalMax. This report can help you stay on top of any outstanding approvals. Delays to the approval process can have a major impact on the success of your business. And in a world where time is money, the last thing you want to be doing is hunting through email chains trying to find out who was responsible for approving a particular Bill or Purchase Order. This latest addition to our financial workflow platform means you’ll have the answer to your bottleneck in next to no time. Simply run a report and pinpoint the issue.